This post was requested by a patron. To support writing like this and request your own post, sign up on my Patreon page. The Bioshock series is about power and history. Power from flesh and history transformed. 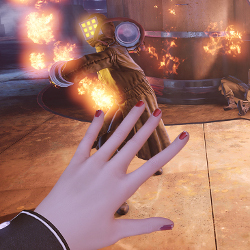 I’ve explored its biopunk underpinnings before, but I haven’t explored the most recent and oroborosian entry in the series: Bioshock Infinite: Burial at Sea Episode 2. It strips the wings from a deity in the service of motivating events in the first game that didn’t need justification, but in the process it introduces some interesting stealth elements in a game not originally built for them.